The HbA1c blood test is used to find out if you have diabetes or prediabetes. It you already have diabetes it is also used to check how well you are controlling it. When you have diabetes the amount of sugar (glucose) in your bloodstream is higher than normal. The higher your blood sugar levels are, the more glucose attaches itself to your red blood cells. The HbA1c blood test measures the amount of glucose attached to your red blood cells. It gives an average of your blood sugar levels over the past two to three months. A result of 40 or lower is normal. What does it mean if my results are too high? 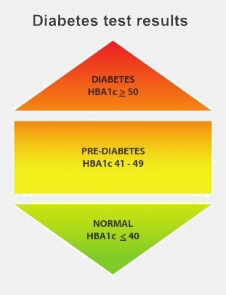 If your result is between 41 and 49 then you have prediabetes. If your result is 50 or higher then you have diabetes. If you result shows that you have prediabetes you should make changes to have a healthier lifestyle. This means eating healthy food and being more physically active. You will have another test in six to 12 months to see if these changes have made a difference. If your result shows that you have diabetes you will need to see your doctor to talk about treatment options. This will normally involve changes in what you eat, other lifestyle changes, and tablets to lower your blood sugar levels. It may also mean you have to start insulin treatment. If you already have diabetes the blood test will show how well you are controlling your blood sugar levels. You will have a target to aim for, but everyone's target is different, depending on age, type of diabetes, and other health problems. Ask your GP what your personal target is. (For most people it will be between 50 and 55.) If the blood test shows that your levels are higher than your target, for example over 65, then you may need to change your medicines. If you need more information about diet and lifestyle advice, or if you want to know more about diabetes you can check the diabetes section or talk to you nurse or GP.